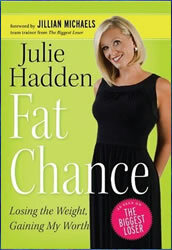 Julie Hadden’s book, Fat Chance, gives readers a behind-the-scenes look of her experiences on the television show ‘The Biggest Loser’ where she accomplished the loss of 45% of her body weight. Julie Hadden details the story of how she was selected for the show, how she was able to lose the weight and ultimately how this changed the way she looked at herself and her life. The book includes a foreword from Jillian Michaels as well as tips, recipes, workouts and inspirational scripture. Fat Chance contains three major sections that are devoted to the different phases of Biggest Loser, Julie Hadden’s weight loss journey: Moment of Recognition, My Surreal Existence on Reality TV and Returning to the Old Life. She explores the reasons why she gained so much weight and provides insight into her realizations. One example is that when she was a child she learned to use food as a substitute for her need of approval and acceptance. Throughout the book Fat Chance, Julie Hadden talks to the reader and encourages an attitude of self-acceptance and positivity. She strongly emphasizes her connection to the Christian faith and incorporates scriptural references in her discussions. Julie Hadden acknowledges that losing weight and maintaining a healthy lifestyle is not always easy but she aims to inspire readers through example and encouragement. She adheres to the approach of eating less and exercising more, although readers will not have to undertake the grueling six-hour workouts that were a part of her life on ‘The Biggest Loser’. Fat Chance does not provide a meal plan but does include a selection of healthy recipes as well as answers to frequently asked questions. Fruit, vegetables, eggs, fish, chicken, lean beef, oatmeal, whole wheat pasta, rice, legumes, mustard, salsa, low-fat salad dressing. Julie Hadden goes into detail about the intense workouts that she had to undergo while she was on ‘The Biggest Loser’. She also provides readers with a look at her current exercise regime that she uses to maintain her weight loss. Fat Chance also includes a selection of sample workouts. Fat Chance – Losing the Weight, Gaining My Worth retails at $14.99. Many readers will find Julie Hadden’s successful weight loss inspirational. Emphasizes the emotional and psychological aspects involved in weight management. Includes a behind-the-scenes look at ‘The Biggest Loser’. Will appeal to Christian readers. May not appeal to those who are not fans of ‘The Biggest Loser’. Readers who are not Christians may not relate to the religious references throughout the book. Fat Chance is the memoir of one of the most successful participants in the television program, ‘The Biggest Loser’, Julie Hadden, who also shares her weight loss tips and general advice for others who want to lose weight. Fat Chance is not a structured weight loss plan but more of an inspirational book that incorporates the Christian perspective of Julie Hadden’s experiences with weight loss and life.